London-based practice Foster Lomas, has unveiled a stunning carbon-neutral home on the Island of Man. 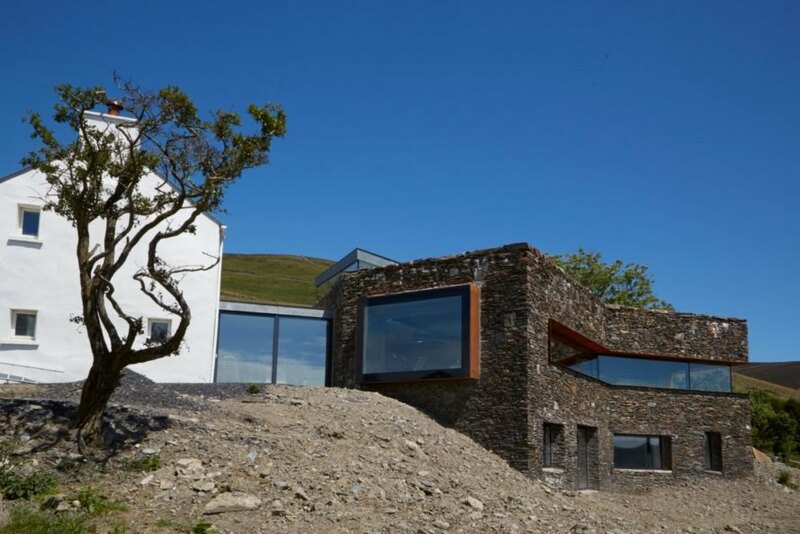 The Sartfell Retreat is a private home built by local craftsman using locally-sourced drystone walls. The home boasts plenty of sustainable features, including an off-grid water system for fresh water and a plush green roof, covered in carbon-capturing hay and native wildflowers, further creating a strong connection with the home’s breathtaking natural setting. Located near Sartfell Mountain, the home is tucked into seven acres of restored hillside. The retreat is actually part of an ambitious plan by the homeowners, a retired scientist and teacher, who set out with the goal of restoring the existing landscape and protecting the existing biodiversity. In collaboration with Foster Lomas and the local charity, Manx Wildlife Trust, the project is part of a master plan which will eventually have a Vistor’s Center that will be used as an educational platform to showcase the area’s biodiversity. Before breaking ground on the modern home, the homeowners and the architects conducted various studies on the local climate and topography. First and foremost, the project was focused on fully restoring the land, which included removing nitrates from the soil in order to allow native plants to grow on site. Additionally, a year before the project was due to start, the architects installed a weather station on the site to gather important data, which was ultimately used to guide the design of the home. Crafted by local builders, the home’s volume follows the natural slope of the land. 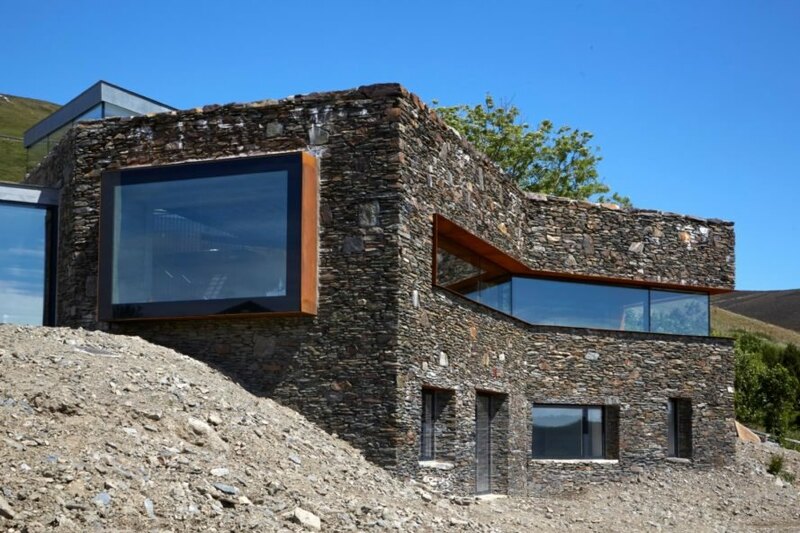 Locally-sourced drystone was used to create ultra-thick walls in order to provide a tight thermal mass. 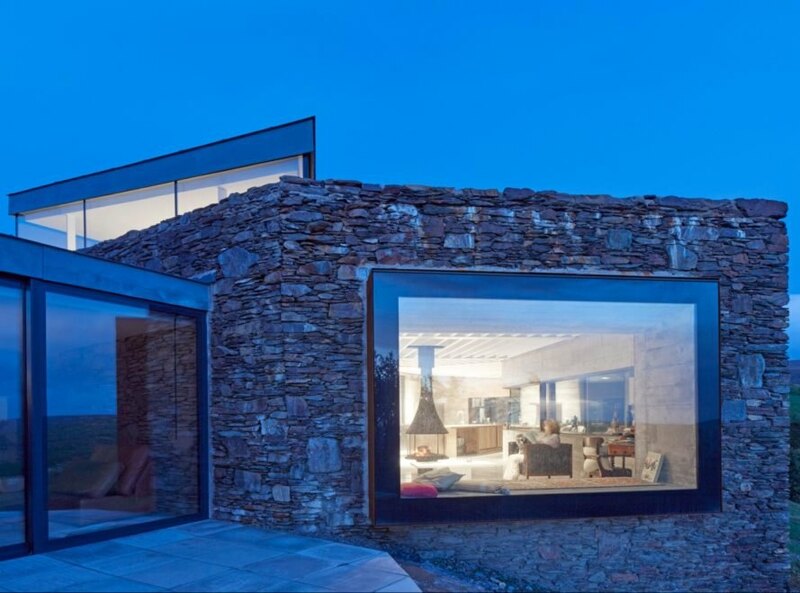 Large ribbon windows were embedded into the drystone exterior to provide unobstructed views from virtually anywhere in the home. The triple-paned windows were placed into protruding frames of corten steel, which helps prevent solar gain. While the exterior of the home seamlessly blends into the incredible rural landscape, the interior design is quite contemporary. 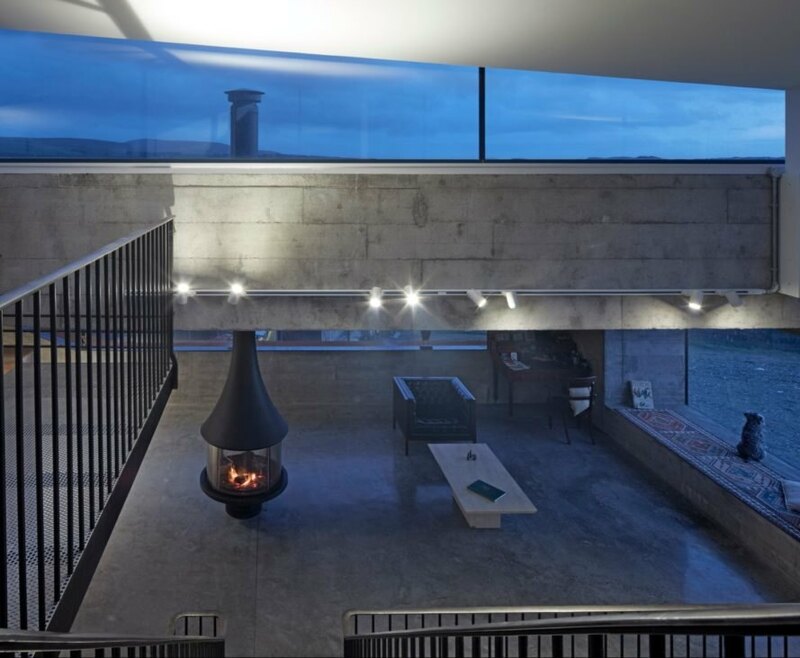 Polished concrete was used for the flooring and walls throughout the home. Minimal, modern furnishings create an open, uncluttered space that puts the focus on the surrounding nature. At the heart of the modern home is a large staircase, made out of perforated metal, that winds up through the home’s three levels. On each level, the stairs are flanked by what the homeowners call the “Knowledge Centre”, a soaring three-level library, stocked with books. 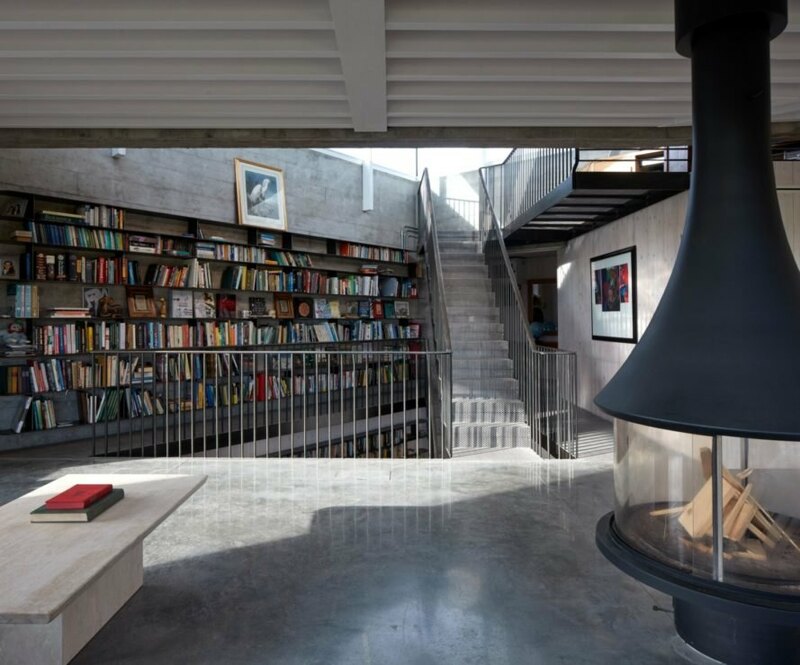 Although certainly an eye-catcher, the stairs actually double as a ventilation stack, enabling the home to achieve its zero-carbon classification. 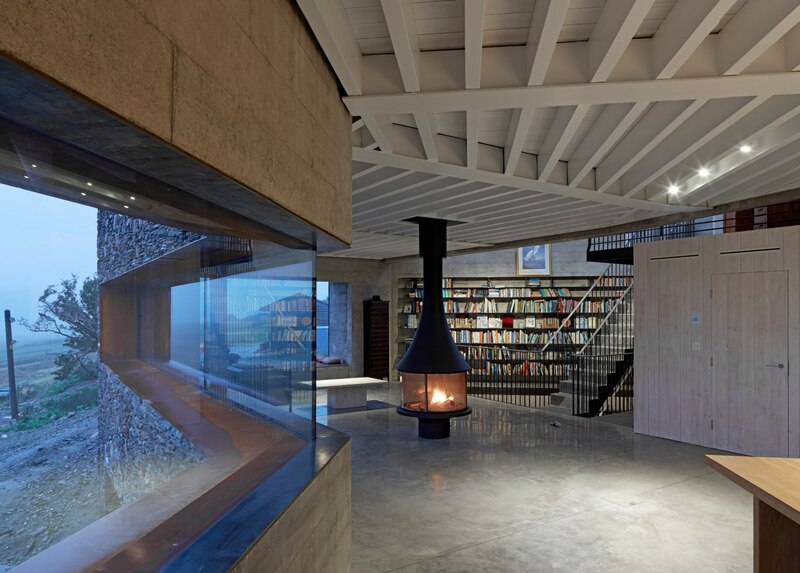 London-based practice Foster Lomas, has unveiled a stunning carbon-neutral home on the Island of Man. 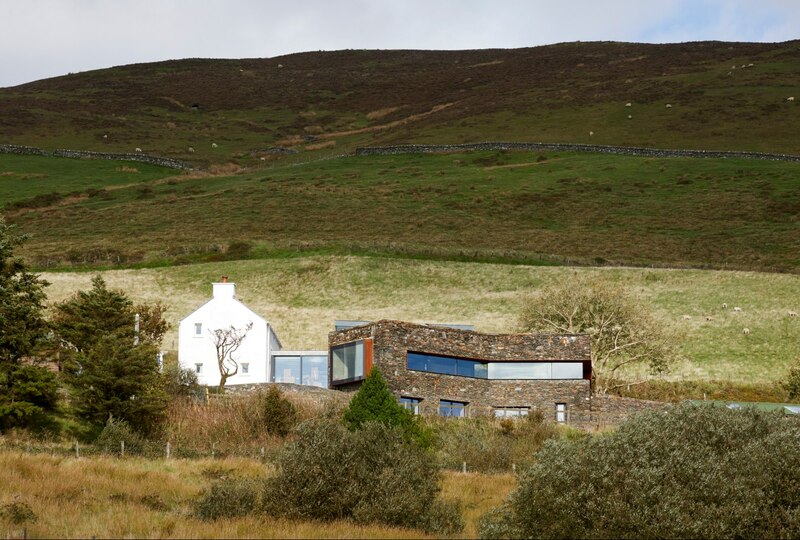 The Sartfell Retreat is a private home built by local craftsman using locally-sourced drystone walls. 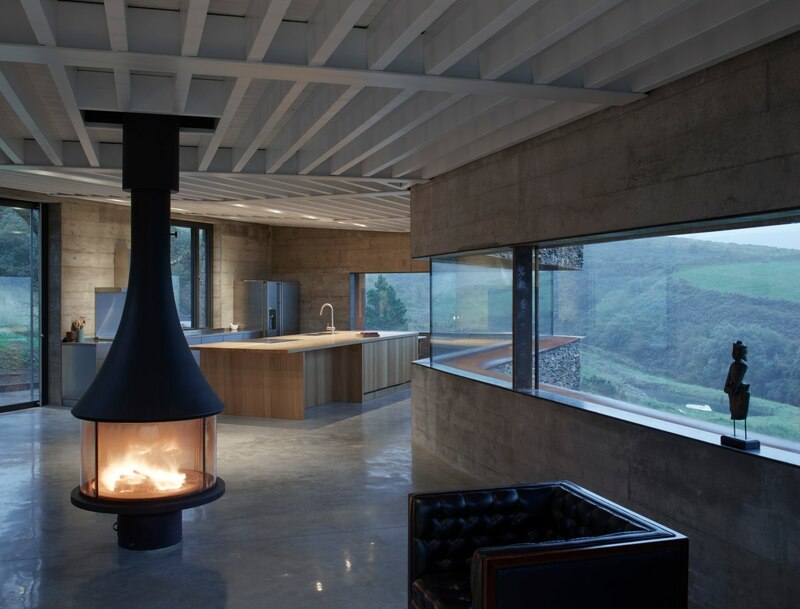 The home boasts plenty of sustainable features, including an off-grid water system for fresh water and a plush green roof, covered in carbon-capturing hay and native wildflowers, further creating a strong connection with the home's breathtaking natural setting. 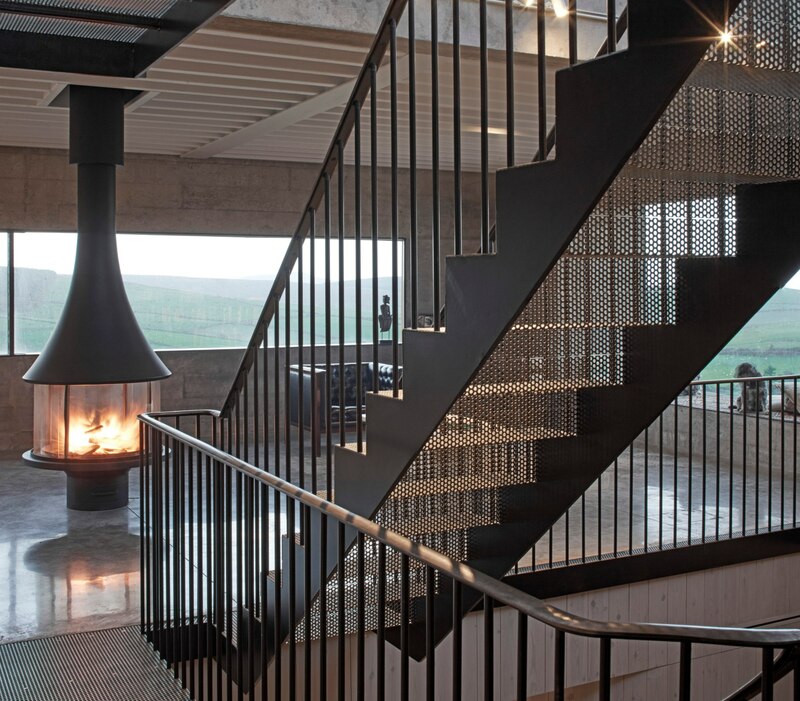 London-based practice Foster Lomas designed the Sartfell Retreat. The Sartfell Retreat is located on seven acres of rolling green hills. 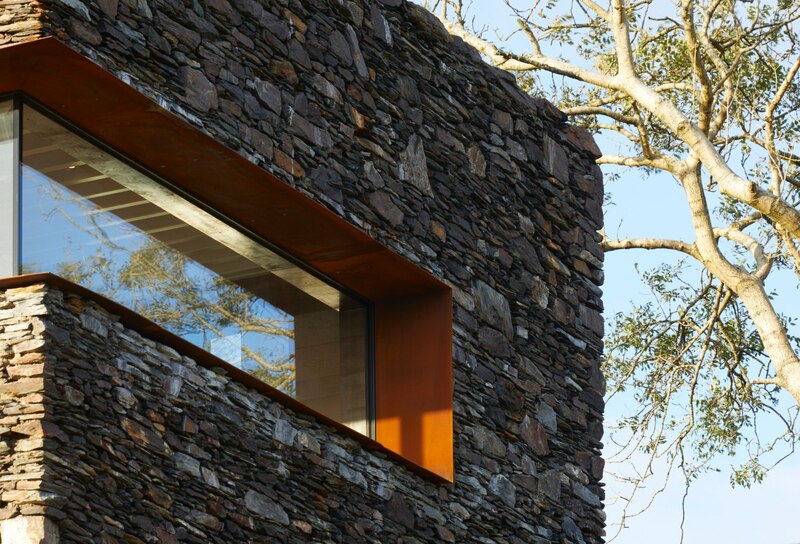 The home is clad in locally-sourced drystone. 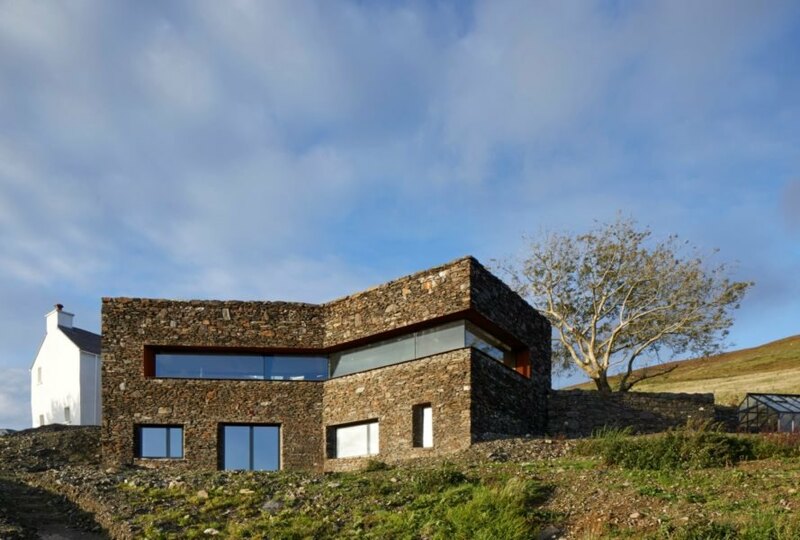 The home was carefully embedded into the natural slope of the land. Ribbon windows provide stunning views. The home's flooring and walls are made out of polished concrete. 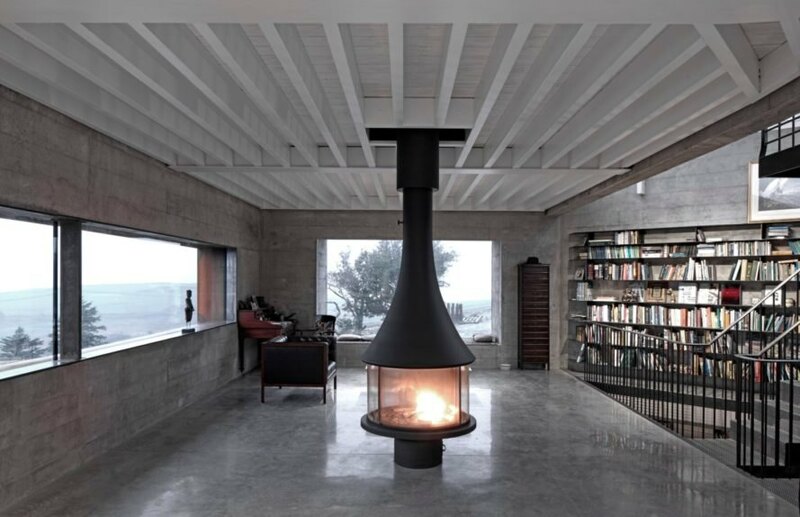 A beautiful fireplace stands in the middle of the living room. 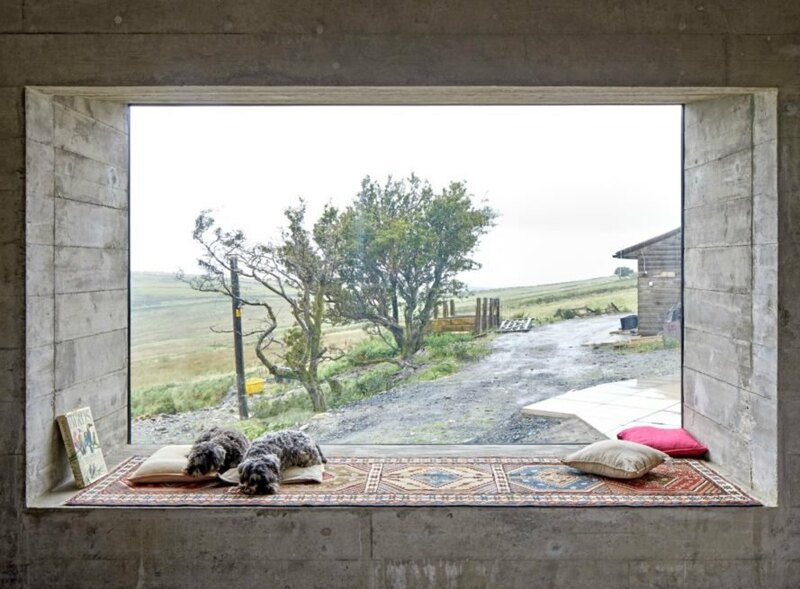 The large windows provide stunning views of the landscape. 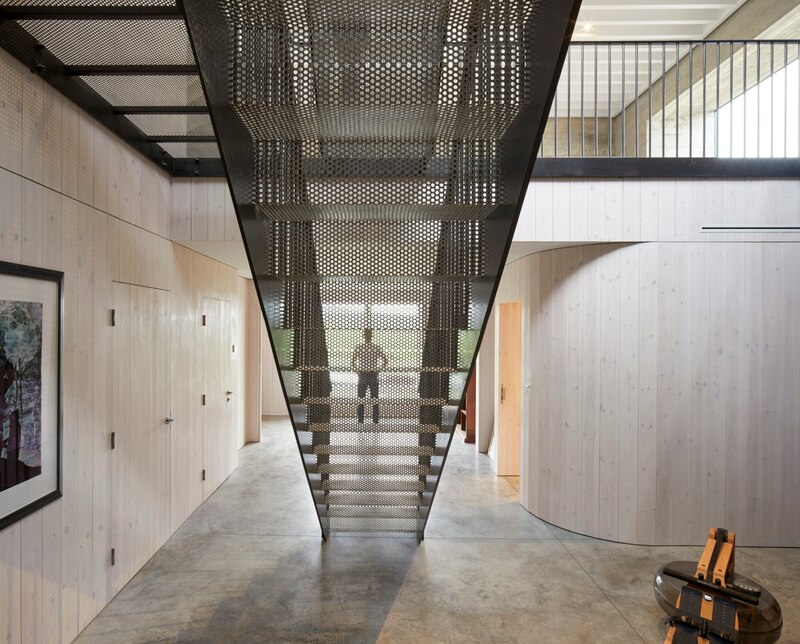 A metal staircase leads up through the home's three levels. The staircase is flanked by a three-level library. 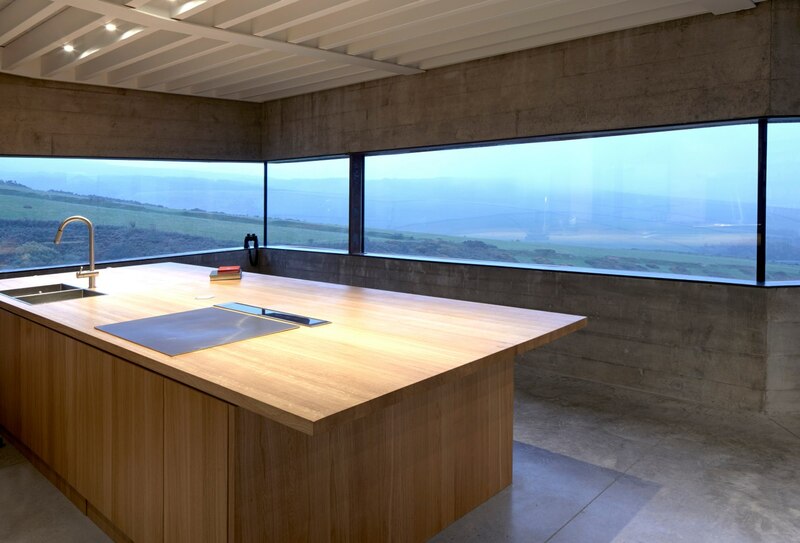 The windows were placed in Corten Steel frames. The home is part of a master plan to turn the area into a biodiversity center. 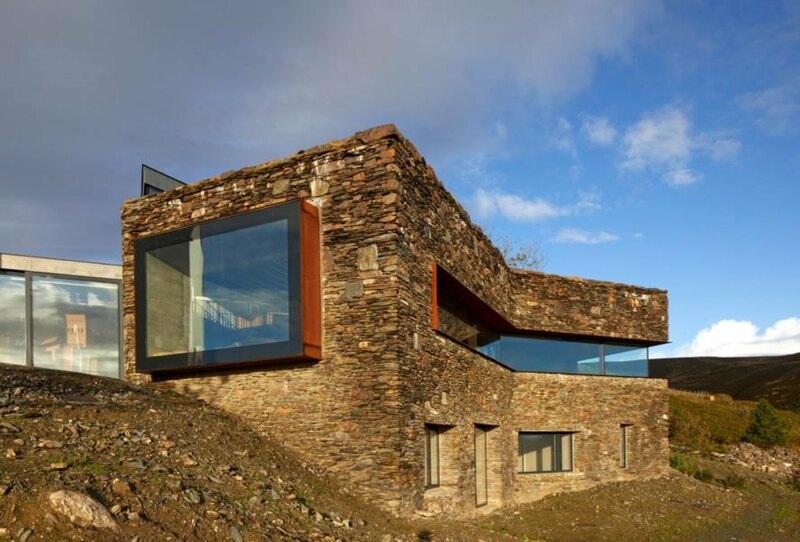 The natural stone walls provide a tight thermal mass for the home. The home's interior is quite contemporary. The home is flooded with natural light. The metal staircase actually doubles as a ventilation stack. The ribbon windows framed the stunning views. Modern, minimal furnishings were used throughout the interior. The home sits on 7 acres of restored hillside. The stone and glass home is the first step in the master plan. The next step in the project will be to design a Visitors Center, also to be designed by Foster Lomas. The home sits on seven acres of restored hillside.